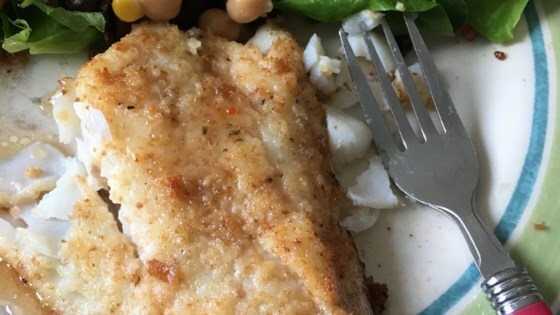 "Haddock (or other white fish) is lightly breaded and baked. Parmesan adds a nice flavor. Quick and easy to prepare, it's a nice alternative to deep frying." In a small bowl, combine the milk and salt. In a separate bowl, mix together the bread crumbs, Parmesan cheese, and thyme. Dip the haddock fillets in the milk, then press into the crumb mixture to coat. Place haddock fillets in a glass baking dish, and drizzle with melted butter. Bake on the top rack of the preheated oven until the fish flakes easily, about 15 minutes. This was really easy to prepare and it was really tasty! Instead of using the milk to coat the fish, I thought it would be easier to use egg. My husband made this, and it was really good! The only problem was that the bottom of the fish/breading got soggy in the oven. Otherwise, perfect!